The post Is Egypt ready for Electronic Payments Law as it comes into force? appeared first on Daily News Egypt. President Abdel Fattah Al-Sisi approved last week the new law regulating non-cash payments entering into force since Wednesday. The president’s decree stipulated that the prime minister shall issue the executive regulations of the law upon the proposal of the minister of finance and the approval of the governor of the Central Bank of Egypt (CBE) and the cabinet within six months from the date of its issuance. Until the regulations are issued, the current laws which do not contradict with the new law shall remain in force. The president also ordered all those subject to the law to adjust their situation so that they can comply with its provisions within six months of issuing its regulations. The cabinet may, upon the proposal of the minister of finance and the approval of the CBE governor, extend this period or exclude certain geographic regions from the law, in whole or in part, for a certain period for national security reasons or in case of force majeure or other emergency situations. The law obliges all state authorities, institutions, and establishments which provide their services to the public and administer public facilities to provide e-payment methods. The question posed by Daily News Egypt here is whether the market is ready to implement this law, after its entry into force, and is the technological infrastructure ready or not? According to the Director General of Visa in North Africa, Ahmed Gaber, the law establishes a new phase in the dissemination of electoral payments culture, and emphasises the extent of the state’s interest in them and their awareness of their importance and impact on the economy and transparency of the financial system. He added that Visa is working with its financial institution customers to expand the scope of accepting digital payments and offer mobile payment solutions and services, such as Scan to Pay, to provide ways of accepting digital payments and their multiple options. He pointed out that for the Egyptian economy, electronic payments, if widely implemented, will contribute toward saving paper and hard copies within the government, and will give customers the advantage of receiving their benefits almost immediately, instead of waiting for the cheques operations, which will accelerate the pace of business completion, collection cycle, and liquidity ratio. “The expansion in the scope of electronic payments will also reflect a reduction in the cost of government execution of several projects, primarily the cost of fuel subsidies and the cost of cash management. Moreover, e-commerce is largely associated with electronic payment systems which will contribute toward reducing the size of parallel economies,” Gaber said. Furthermore, he stressed that infrastructure in Egypt is conducive to the dissemination of digital payments, especially with the government’s clear intention to do so, and Visa’s efforts and its customers from financial institutions to provide solutions and services which facilitate them. He pointed out the recent partnership between Visa, Banque Misr, and ExxonMobil Egypt to launch a unique strategic partnership in order to expand the acceptance of e-payments and the provision of electronic payment services for petroleum services, through 100 ExxonMobil stations as a primary stage in a bid to further financial inclusion. This strategic partnership aims to enable Visa cardholders to use their cards at ExxonMobil stations, and to expand the acceptance of electronic payments at these stations, he added. He added that Banque Misr is pushing this partnership forward through the deployment of electronic payment acceptance machines at petroleum stations, and design loyalty programmes for card users and holders. “This partnership is a strong example of the combined efforts of leading institutions such as Banque Misr, Visa, and ExxonMobil Egypt, to contribute to financial inclusion and expand the acceptance of electronic payments, allowing increased benefits for traders, consumers, and the Egyptian economy as a whole,” he said. Gaber added that Visa is continuing its cooperation with the Federation of Egyptian Chambers of Commerce (FEDCOC) and is expanding the scope of this cooperation by reaching out to various segments of traders under the federation’s umbrella, which carries out various activities aimed at serving these merchants in particular, and the community in general. He pointed out that the cooperation with the FEDCOC comes within the framework of the important agreement signed by Visa at the end of 2016, which reflects the company’s recognition of the importance of the federation, which includes more than four million trade members, meaning there is a huge segment which can work with Visa to expand the acceptance of digital payments in the Egyptian market. The CBE Sub Governor for Payment Systems and Information Technology, Ayman Hussein, said in previous statements that the legislation focus is one of the most important axes of transitioning toward a society less dependent on cash. He pointed out that this framework includes the law for the development of non-cash financial transactions, which was adopted by the National Payments Council and approved last week, as well as the amendment of the CBE and Banks Law No. 88 of 2003, which includes a dedicated section for payment systems within this framework. The CBE will also be enabled to extend its supervisory role over e-payment companies and non-banking facilities which provide payments solutions. Hussein pointed out that the implementation of the new law will be phased in, stressing that the infrastructure necessary to implement it has become fully qualified, and that its implementation will not cost the citizen any financial burdens or additional costs because it requires those who provide public services to the public or manage public facilities to provide means of acceptance for non-cash payment at all service collect points for no additional cost. The law regulating the non-cash means of payment consists of nine articles regulating the electronic payment process, its controls, and penalties violated by its provisions. Non-cash payment means refers to any mode of payments resulting in an addition to one of the beneficiary’s bank accounts such as deposit, transfer, and debit orders, credit and debit cards, payment by mobile phone or other means approved by the Governor of the Central Bank of Egypt. A bank account is a contract under which a natural or legal person agrees with a bank registered with the CBE, or one of the entities authorised to initiate the deposit or credit activity in Egypt to open an account. This is then used to record all transactions for payment, receipt, and settlement of mutual payments in cash or through electronic cash units, such as a current account, a savings account, a time deposit account, a mobile payment account, credit cards, and prepaid card accounts. All state authorities and entities, public corporate entities and companies which the state owns all or most of its capital shall be obliged to pay the financial dues of their members and employees, experts, chairpersons and members of boards of directors, committees, and social insurance contributions by non-cash means of payment, excluding foreign travel compensations. It also stipulates that private legal persons and establishments of various kinds shall be obliged to pay the dues of their employees, experts, chairpersons, and members of the boards of directors, committees, and social security contributions by non-cash means of payment, when employee numbers and their total monthly wages exceed the limits specified in the executive regulations. Repayment of receivables from suppliers, contractors, service providers, and other contractors. Distribution of profits resulting from the contribution to the capital of companies or from investment funds. Payment of dues of the members of trade unions and entitlements of participants in private insurance funds participating in special insurance funds and insurance compensation. The disbursement of donations and aid by associations and institutions working in the field of civil work or other legal persons or establishments provided for in Article 2 of this law. Payment of the dues in the cases of purchase, lease, exploitation or use of land or real estate, or express transport vehicles by the authorities and state bodies and legal persons and the facilities provided for in Article 2 of the law. A decision by the prime minister on the proposal of the minister of finance and the approval of the governor of the Central Bank of Egypt may add additional payments to be paid by non-cash means of payment. The authorities and state bodies, legal persons, and establishments providing public services to the public shall be responsible for the administration of public facilities by providing means of acceptance for non-cash payment to their clients at all ports of collection for service without additional cost, as set out in the executive regulations of this law. This shall be without prejudice to the possibility of additional charge for the provision of the services referred to by electronic means if the performance of the service is linked to delivery to the recipient. Taxes, customs, duties, and fines. For services and amounts due to the entities stipulated in Article 4 of this law. Cash financing premiums, insurance premiums, union subscriptions, and private insurance fund contributions. Subsidies and donations received by associations and institutions working in the field of civil work or other legal persons or establishments provided for in Article 2 of this law. Collecting the proceeds in cases of sale, rent, exploitation or use of land, real estate, or express transport vehicles by the authorities and state bodies, and the legal persons and establishments stipulated in Article 2 of this law. The minister of finance and the Governor of the Central Bank of Egypt may, upon a decision by the prime minister, add additional payments to be collected by non-cash means of payment. The powers, state bodies and public legal persons dealing with the public after the approval of the minister of finance may grant positive incentives for payment by means of non-cash means of remuneration, including the reduction or refund of the amounts paid to them in this means. The executive regulations of this law shall determine the manner and rules of granting such incentives. Violators shall be punished by a fine of not less than 2% of the value of the amount paid in cash and not exceeding 10% of the value of this amount, and a maximum of EGP 1m, for whoever violates the provisions of Articles 2, 3 and 5 of this law. The same penalty shall be imposed upon anyone who has broken down the payments in order to circumvent the application of the limits prescribed by this law. Any person who contravenes the provisions of Article 4 of the first paragraph of this law shall be liable to a fine of not less than EGP 100,000, and not exceeding EGP 300,000. The fines in this article shall be doubled in case of re-committing. Without prejudice to the criminal liability of natural persons, the person responsible for the actual administration of the legal person shall be punished by the same penalties prescribed for acts committed in violation of the provisions of this law–if he is aware of them. The legal person shall be responsible in solidarity with the convicted person for the discharge of such penalties as financial sanctions and compensation in this case. The proceeds of the fines provided for in Article 7 of this law shall be transferred to an account in the unified treasury account of the ministry of finance, and shall be allocated to support efforts to provide the infrastructure of non-cash means of payment to government bodies, and raise the awareness of citizens by these means. This account shall be managed and disbursed from according to the rules specified in the executive regulations of this law, provided that the surplus of the funds of this account shall be transferred from one fiscal year to another. The post US dollar loses 5 piasters against Egyptian pound on Wednesday appeared first on Daily News Egypt. The US dollar lost about five piasters from its value against the Egyptian pound on Wednesday, averaging EGP 17.21 for buying and EGP 17.31 for selling, down from EGP 17.26 for buying and EGP 17.36 for selling on Tuesday. The official US dollar price in the Central Bank of Egypt lost between 3-4 piasters, reaching EGP 17.2 for buying and EGP 17.32 for selling, compared to EGP 17.25 for buying and EGP 17.38 for selling on Tuesday. This is considered the lowest US dollar price since March 2017. Since the start of March, the US dollar lost more than 23 piasters of its value, and its losses were estimated at 62 piasters since the downward trend started in January 2019, while its total losses were estimated to be 60 piasters since the beginning of 2019. The post Bank Audi plans to open nine new branches in Egypt appeared first on Daily News Egypt. Bank Audi plans to expand its footprint in Egypt in 2019. As part of Audi’s nationwide branch expansion plan, nine new branches will be inaugurated in strategic locations mostly outside Greater Cairo to cover more governorates and to reach more diversified segments of customers. Driven by uncompromising mission to offer the best banking services and financial support, Bank Audi is leveraging the new branches as a way to maintain its valued customers’ satisfaction while extending financial support and adapting promptly and efficiently to clients’ ever-changing needs, Mohamed Bedeir, acting CEO and managing director of Bank Audi Egypt, said. Bank Audi’s geographical expansion plan aims at reaching various clients’ segments in accordance with the state’s vision and the CBE’s financial inclusion initiative which will in return level up the economic indicators of the state’s economic development. Noteworthy, Bank Audi entered the Egyptian retail banking market through purchasing the three branches of Cairo Far East Bank in 2006. It has since expanded its network to 47 branches. The new expansion plan will boost its geographical coverage, bringing its branches up to 70 branches. The post CBE extends its initiative to support defaulters at ABE until June appeared first on Daily News Egypt. The post QNB Alahli achieves strong growth in net profits despite high operational expenses appeared first on Daily News Egypt. The business results of QNB Alahli revealed a strong growth in net profit year-over-year (y-o-y), recording EGP 2bn, with an increase of 26%, compared to the first quarter (Q1) of 2018, in addition to an 11% increase, compared to Q4 of 2018. According to a research note by Beltone Financial, this growth came with supported by the strong increase of the net interest income of 10%, recording EGP 3.2bn. However, this increase was partially due to a major increase in operational expenses, as they increase by 35% on an annual basis, which led to increasing the cost-to-income ratio by 170 basis points (bps), in addition to loss differences resulting from converting balances worth EGP 141m into foreign currencies. The note added that the burden of impairments for credit losses increased by 25% on an annual basis as a result of increasing the allocations on the balances of treasury bills (T-Bills). According to Beltone, the increase in the net income on a quarterly basis came as a result of the burden of impairments for credit losses declining by 76% as a result of increasing credit allocations during Q4 of 2018. Most of them came from direct loans to companies. Beltone said the financial position of QNB is slowing down, as deposits dropped by 2% since the start of the year until now, reaching EGP 201bn, affected by companies’ deposits. It added that the bank has maintained a deposit portfolio of non-interest bearing deposits and variable-rate deposits. With regard to employment, Beltone noted that the bank’s total loans had almost stabilised, rising by only 0.4% since the beginning of the year, up from EGP 137.4bn until March 2019. The growth in total loans since the beginning of the year was supported by an increase of 6.1% in individual loans, which exceeded the fall of corporate loans by 0.6%. They constitute 84.1% of the total loans. According to Beltone, the loan-to-deposit ratio of the bank has improved in the last few quarters to 71.1% in March 2019, compared to 60.3% in March 2018, the highest among banks operating in Egypt. On the other hand, the research note showed that the bank’s investments in T-Bills declined by 18.3% since the beginning of the year, which led to a decline in its contribution to total assets from 18.7% in December 2018 to 15.7% in March 2019. Additionally, the dues from bank’s balances saw a noticeable growth, reaching 23.7% since the start of the year. The bank’s non-performing loans increased by 13%, mainly affected by corporate loans, which led to a rise of 31 bps to 2.73%. According to Beltone, the revenue on average shareholders’ equity was almost unchanged at 28.6%, thanks to improved return on average assets, up 3.2% from 2.9% last year, supported by a stable banking income, risk cost containment, and lower actual tax rates, offsetting the drop in leverage by about 1.2 times y-o-y. The note explained that the increase in banking income was the result of a 98 bps increase in interest margin on a y-o-y basis, heavily supported by lower financing costs, despite the lower price of corridor and interest on T-Bills on an annual basis, reflecting the bank’s strong asset and liability management to maintain levels of interest margins, even with conditions of lower interest rates and periods of lower interest deposits pricing. Beltone expected the effect of applying the IFRS9 mechanism to be minor on the bank. Moreover, it pointed out that profits may fluctuate as a result of adopting credit allocations on the items subject to credit risks instead of clients’ loans. The bank revealed that the cost of risks to loans has dropped to only 5 bps compared to 19 bps last year and 78 bps in Q4 of 2018. On the other hand, the increase in allocations of credit losses is mainly due to established allocations of government securities which are expected to fluctuate due to their short terms. The post Attijariwafa Bank Egypt implements $1.7bn worth trade operations in 2018 appeared first on Daily News Egypt. The post Capital flows will be linked to three factors: CBE appeared first on Daily News Egypt. The Central Bank of Egypt (CBE) said that emerging markets (EMs) have slightly witnessed the recovery of capital inflows in January after a long period of absence since February 2018. In its quarterly report on monetary policy, the CBE said that the capital flows in the coming period will be linked to three main factors: the tightening global financial conditions, the economic activity forecast, and prospects for more tension in international commercial policies. It is expected for Egypt’s GDP to continue recovering, supported by ongoing structural reform, despite the possible impacts of such procedures to control the state’s general finances. The CBE explained that the cut-off date for the data included in this report is 10 January 2019. Some of the presented data are preliminary or subject to revisions. There has been new incoming data since the cut-off date, including, but not limited to, the release of the inflation statistics for January and February 2019. Furthermore, the CBE’s monetary policy committee decided to cut the CBE’s key policy rates by 100 basis points (bps) in its meeting held on 14 February, and kept policy rates unchanged in its meeting held on 28 March. Global economic as well as trade growth continued to slow down, while international oil prices continued to decline, and EMs witnessed net capital inflows for the first time since January 2018. Economic growth of Egypt’s external environment is estimated to have continued to soften for the second consecutive quarter during the fourth quarter (Q4) of 2018, registering 2.5% down from 2.7% in the previous quarter, and from 3.2% in Q4 of 2017, the highest pace since 2011. Economic growth in advanced economies is estimated to continue its ease for the fourth consecutive quarter to register 1.5% in Q4 of 2018, compared to 1.8% in Q3 of 2018, as slower growth in the euro region, the United Kingdom, and Japan more than offset a stronger growth in the United States. On the other hand, economic growth in emerging economies continued to inch up, registering 4.8% in Q4 of 2018, maintaining continuous improvement between Q4 of 2015 and Q2 of 2018. Higher growth in Brazil and Russia more than offset slower growth in India and China, compared to the previous quarter. The CBE noted that headline inflation of Egypt’s external environment declined slightly in Q4 of 2018 for the first time since Q1of 2018, registering 2.3%, compared to 2.5% in Q3 of 2018. Inflation in several advanced economies declined to register 2.0% in Q4 of 2018, down from 2.2% in Q3 of 2018. Meanwhile, inflation in emerging economies dropped slightly to register 2.9% in Q4 of 2018, after accelerating to 3.0% in Q3 of 2018. The deceleration of the inflation rate in China, Brazil, and India more than offset the acceleration of the inflation rate in Russia, compared to the previous quarter. Meanwhile, annual growth of global trade continued to slow down for the fourth consecutive quarter in Q3 of 2018 to register 3.6%, compared to 3.8% in the previous quarter, and down from a peak of 5.3% in Q3 of 2017. Brent crude oil prices continued to decline to register an average of $7.4 per barrel in December 2018, after peaking at $86.1 a barrel in mid-October 2018 and before inching up slightly in January 2019. Lower oil prices were mainly driven by a more favourable contribution from the supply side, which led major producers to agree on implementing a production cut of 1.2m barrels per day starting January 2019. Meanwhile, a less favourable contribution from the demand side reflected concerns regarding global economic growth. International food prices, using domestic consumer price index (CPI) basket weights of core food items, continued to decline on annual terms in December 2018 for the sixth consecutive month, however, by the weakest magnitude since July 2018 at negative 2.4%. The CBE attributed the decline to dairy products, oils, and red meat as production conditions improved. The Federal Reserve (Fed) raised its policy rate by 25 bps in December 2018, marking the fourth policy rate hike in 2018, and bringing the cumulative changes during 2018 to 1.0 percentage point. This comes after raising policy rates by 1.25 percentage points during five meetings between December 2015 and December 2017. The Bank of England kept its policy rates unchanged in November 2018, after raising it by 25 bps in August 2018 for the second time since November 2017. The European Central Bank (ECB) also kept its policy stance unchanged. The three central banks made no changes to their asset purchase programmes since the previous monetary policy report. The Fed maintained its balance sheet unwinding plan which started in October 2017, slowing down the amount of government debt it reinvests. Meanwhile, the ECB maintained its plan for phasing out its asset purchase programme, halving monthly purchases since January 2018 to €15bn until the end of December 2018. Capital flight from EMs, which started in February 2018, reversed slightly in January 2019. The direction of net capital flows into EMs remains subject to the pace of tightening global financial conditions, the growth outlook, as well as the prospects of further escalation of trade tensions. The CBE explained that after improving for seven consecutive quarters, the current account deficit stabilised in Q3 of 2018, compared to Q3 of the previous year. A less favourable contribution from the hydrocarbon trade deficit, remittances, and net income payments have more than offset the more favourable contribution from net services receipts and the non-hydrocarbon trade deficit. Nevertheless, the negative net exports of goods and services continued to narrow in Q3 of 2018 on annual terms for the seventh consecutive quarter. This was due to a more favourable contribution from exports of goods and services, which more than offset the less favourable contribution from imports. However, the pace of annual improvement in net exports of goods and services continued to slowdown for the fourth consecutive quarter. The hydrocarbon trade deficit continued to improve on annual terms in Q3 of 2018 for the third consecutive quarter, however at a slower pace compared to the previous quarter. The improvement was mainly driven by higher exports, which more than offset the increase in imports. The non-hydrocarbon trade deficit continued to widen on annual terms in Q3 of 2018 for the fourth consecutive quarter, however, at a slower pace compared to the previous quarter. It explained that this was mainly due to slower growth of imports, which more than offset the annual decline in exports for the first time since Q2 of 2017. The services surplus continued to increase in Q3 of 2018 on annual terms and its contribution to the improvement of the current account deficit rose, yet its pace of growth stabilised in Q3 of 2018. 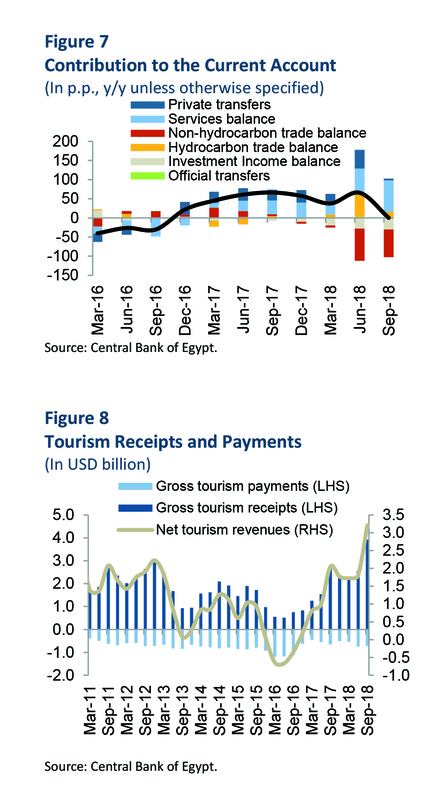 A more favourable contribution from transportation excluding Suez Canal tolls, net government services as well as net receipts from tourism have offset the less favourable contribution from Suez Canal tolls and net other services. Meanwhile, the annual improvement of remittances declined in Q3 of 2018 to its slowest pace since Q3 of 2016. The CBE attributed that to lower gross inflows and stronger gross outflows. The decline in gross inflows was due to a less favourable contribution from newly-issued capital and the oil and gas sector, which more than offset the more favourable contribution from non-residents’ purchases of real estate and net purchases of companies and assets by non-residents. Portfolio flows, excluding bonds, continued to register a net outflow in Q3 of 2018 for the second consecutive quarter amid unfavourable global conditions for EMs. This, however, was more than offset by net inflows from net foreign assets of commercial banks. Gross international reserves declined to $42.6bn in December 2018 from the historic peak of $44.5bn which was registered in the previous month. After increasing for six consecutive quarters and stabilising in Q2 of 2018 at 5.4%, real GDP growth softened slightly to 5.3%. The decline in the contribution of investments to the GDP has more than offset the improvement in that of net exports and, by a lesser extent, consumption. The drop in the contribution of investment was mainly driven by the public sector, while investments by the private sector contributed positively. The improvement in the contribution of net exports was mainly driven by the decrease in real imports, as growth of real exports continued to weaken since Q4 of 2017. At the sectorial level, the CBE added, growth softened mainly due to the construction and the non-petroleum manufacturing sectors, in addition to small weaknesses in other sectors. This has more than offset the improvement in tourism, communication, and natural gas extractions. Available leading indicators for the non-hydrocarbon sector mostly point to weakening activity in Q4 of 2018. The Purchasing Managers’ Index (PMI) weakened compared to its average level in Q3 of 2018. Industrial production contracted on annual terms in October and November 2018, compared to an average expansion in Q3 of 2018. Suez Canal net tonnage grew on annual terms at a slower pace in Q4 of 2018 compared to Q3 of 2018. On the other hand, total car sales grew on average at a faster pace in October and November, compared to the average pace registered in Q3 of 2018. Meanwhile, natural gas production increased on annual terms at faster pace during October 2018, compared to the average pace in Q3 of 2018. Following the fading of the exchange rate revaluation effect in Q4 of 2017, annual M2 growth continued to decline to average 14.2% in Q4 of 2018, supported by fiscal consolidation, according to the CBE. In Q4 of 2018, the contribution of foreign non-bank and external financing continued to decline, in line with the reversal of net portfolio inflows, due to global factors as well as the absence of Eurobond issuances. Together they have more than offset the increase in domestic bank financing. In addition to the decline in M2 growth, inflationary pressures were further dampened by the drop of broad money velocity in Q3 of 2018, after having increased between Q3 of 2017 and Q2 of 2018, albeit by a weaker momentum since Q1 of 2018. Meanwhile, following its decline between Q2 of 2017 and Q1 of 2018, the contribution of claims on the private sector to M2 growth continued to increase in Q4 of 2018 for the third consecutive quarter, supported by initiatives at preferential interest rates. Similarly, inflation adjusted letters of credit L/C claims on the private sector began to witness annual increases since Q1 of 2018, after recording annual contractions in 2017. The recovery was especially evident for claims on the private business sector, while claims on the household sector recovered by a relatively weaker magnitude. Furthermore, the negative contribution of net foreign assets that are not related to fiscal deficit financing continued to ease since the fading of the exchange rate revaluation effect. On the other hand, the contribution of net claims on public economic authorities declined slightly and claims on public sector companies roughly stabilised in Q4 of 2018. Within the components of M2, the currency in circulation (CIC) as a percent of L/C deposits in M2 declined slightly in Q4 of 2018 for the second consecutive quarter, recording a ratio below its long term historical average, suggesting lessening currency holding behaviour. Furthermore, despite the slight increase in the annual growth of foreign currency (F/C) deposits in US dollar in Q4 of 2018, the composition of private sector deposits continued to be increasingly leaning towards L/C, leading the dollarization ratio of F/C deposits to total deposits in M2 to continue falling. Moreover, the structure of household deposits in L/C continued to be dominated by deposits more than three years since May 2018, following one and a half years of dominance by deposits less than three years amid the introduction of one and a half year saving certificates at a higher rate compared to longer term saving certificate rates. The reversal of the structure of household deposits is consistent with redemptions of these certificates since May 2018, given their cancellation by public banks in late April 2018. Annual growth of the monetary base (M0), adjusted by total excess liquidity, continued to decline in Q4 of 2018 for the fifth consecutive quarter due to the CBE balance sheet operations which lowered excess liquidity growth. The money multiplier, measured as the ratio between local currency components of broad money and M0 as defined above, remained broadly stable for the fifth consecutive quarter in Q4 of 2018, following its decline between Q3 of 2016 and Q3 of 2017. Real monetary conditions remained tight, backed by receding inflationary pressures as well as previous policy rate increases, notwithstanding the cumulative 200 bps policy rate cuts in the beginning of 2018. Excess liquidity declined in December 2018 for the first time since December 2017 to record an average of EGP 717.3bn (13.5% of the GDP) during the maintenance period ending in 31 December 2018. However, the absorption of excess liquidity over the short term via the seven-day deposit auction and overnight deposit facility remained relatively stable, recording EGP 63.6bn (1.3% of the GDP and 8.9% of excess liquidity) since mid-February 2018. The effective maturity of liquidity-withdrawing operations greater than seven days continued to range between 38 and 69 days since April 2018, compared to 21 days on average between October 2017 and March 2018. Thus, interbank activity and the interbank yield curve remained relatively stable since April 2018, with interbank rates continuing below the policy rate by around 30 bps. Yields for L/C government securities stayed stable at 15.8% net of tax since October 2018, after continuously rising between May and September 2018. This compares to 13.7% in April 2018 and 14.6% on average in Q4 of 2017, before the policy rate cuts by the CBE. The impact of rising risk aversion toward demand for EM assets has more than offset the impact of the cumulative 200 bps policy rate cuts in February and March 2018. Notwithstanding the recovery of demand for L/C government securities in January 2019, the weighted average cost of finance remained relatively stable during the first two issuances due to a higher acceptance-to-required ratio. Meanwhile, Egyptian Eurobond yields declined somewhat in January 2019, in line with the improvement in the risk premium for EMs, after it has been increasing during most of 2018. Moreover, Egypt’s CDS spreads remained relatively low compared to most peers with similar sovereign credit rating. Furthermore, Egypt’s outlook was raised to positive in August 2018 by Moody’s, while S&P upgraded Egypt’s credit rating in May 2018. In the banking sector, rates for new deposits remained relatively stable to record 12.8% on average since April 2018, after declining in response to the cumulative 200 bps cut in February and March 2018. Concurrently, rates for new loans inched up slightly to 17.3% on average during October and November 2018, after receding to 17.0% in Q3 of 2018. The pricing of new deposits declined by 1.3x compared to the cumulative 200 bps policy rate cut, mainly driven by strong drops of deposit rates in public sector banks, while the pricing of new loans decreased by 0.9x. In equity markets, real prices continued to be affected by the negative sentiment on EMs. Nevertheless, the EGX 30 USD index continued to outperform the MSCI EMs index since March 2018, despite its drop since June 2018. At the same time, real unit prices remained relatively stable in Q4 of 2018, after declining in select districts of Cairo’s residential real estate sector during Q3 of 2018 for the first time since Q4 of 2016. The demand continued to shift from the secondary market toward the primary market, given more flexible payment plans offered by numerous developers. Annual core inflation continued to record single digits for sixth consecutive month. Annual headline inflation declined to 12.0% in December 2018 from 15.7% in November 2018, thereby leading average inflation during Q4 of 2018 to record 15.1%. As a result, the inflation target of 13% (±3 percentage points) for Q4 of 2018, which was announced in May 2017, has been achieved. The deviation from the target mid-point was due to supply-side factors that are outside the scope of monetary policy. Annual headline inflation has been affected by fiscal consolidation measures, which were impacted by a higher-than-expected increase of international oil prices. Furthermore, headline inflation was affected by temporary supply shocks in select fresh vegetables in September and October 2018. These factors led inflation to rise to 17.7% in October 2018 from the 25-month low of 11.4% in May 2018. The decline of annual inflation in November and December 2018 reflected the reversal of the temporary supply shocks in select fresh vegetables as well as the containment of underlying inflationary pressures. In the meantime, annual core inflation continued to register single digits for the sixth consecutive month, averaging 8.5% between July and December 2018, the lowest rate in over two years. This, combined with the decline of annual headline inflation in November and December 2018, led the spread between annual headline and core inflation to narrow significantly after peaking in October 2018. Monthly headline inflation was mainly driven by food inflation since August 2018, while non-food inflation has been contained, reflecting only expected seasonal increase in clothing prices in November 2018. Inflation of fresh vegetables was the main contributor to food inflation. It was elevated between June and October 2018 due to seasonal effects which were heightened by the indirect effects of the fiscal consolidation measures, as well as transitory supply shocks related to potatoes and tomatoes, which reversed in November and by a larger extent in December 2018. Prices of tomatoes declined for the second consecutive month in December 2018, after recording price increases for four consecutive months. Also, prices of potatoes declined, after recording price increases for nine consecutive months. Simultaneously, prices of core food items were largely stable, except for poultry and eggs, which experienced volatility since July 2018, as well as rice, which increased in December 2018 for the third consecutive month. The largely stable core food inflation witnessed domestically since August 2018 led to divergence between domestic and international core food price developments. International core food inflation recorded its first positive monthly rate in December 2018, after consistently recording negative monthly rates since June 2018, driven mainly by prices of poultry, red meat, and dairy products. This comes after domestic and international core food price developments have been largely consistent in the first half of the year, except in June 2018 due to domestic fiscal consolidation measures. The CBE stated that policy rates and the inflation outlook remain consistent with achieving the targeted disinflation path. “This includes achieving the 9% (±3 percentage points) inflation target for Q4 of 2020-which was announced in December 2018-down from the 13% (±3 percentage points) inflation target for Q4 of 2018, announced in May 2017, which has been successfully achieved,” declared the CBE. “Real GDP growth is expected to continue recovering, benefiting from continued structural reforms, despite being affected by potential fiscal consolidation measures,” it added. The CBE explained that the primary fiscal balance is targeted to record a surplus of 2.0% of the GDP in 2018/19, compared to an estimated surplus of 0.1% of the GDP in 2017/18, and a deficit of 1.8% of the GDP in 2016/17, and is targeted to maintain this surplus thereafter. Meanwhile, the overall fiscal deficit is targeted to decline to 8.4% and 7.2% of the GDP in 2018/19 and 2019/20, respectively, compared to an expected 9.8% in 2017/18 and 10.9% in 2016/17, and is targeted to continue declining subsequently. The outlook for Brent crude oil prices incorporated in the domestic inflation outlook remained broadly unchanged following its downward revision, yet spot prices remained subject to volatility due to potential supply-side factors. Cost recovery for most fuel products is expected to be reached by mid-2019, and automatic fuel price indexation is expected to be implemented. Meanwhile, international food price forecasts, relevant to Egypt’s consumption basket, are expected to be stable during 2019 before increasing in 2020. In addition to international commodity price developments, risks surrounding the inflation outlook from the global economy continue to include trade tensions, economic growth developments, as well as the pace of tightening financial conditions. Meanwhile, domestic risks continue to include the timing and magnitude of potential fiscal consolidation measures and the evolution of inflation expectations, it concluded. The post Crédit Agricole Egypt inaugurates first cashless branch appeared first on Daily News Egypt. The post Credit Agricole Egypt prepares to comply with new banking law, increase capital to EGP 5bn: Managing Director appeared first on Daily News Egypt. The post Basic interest rates, future outlook of inflation consistent with our goals: CBE appeared first on Daily News Egypt. The post Ahli United Bank’s share of Egyptian market is 3%: El Messeery appeared first on Daily News Egypt. Nevine El Messeery, the CEO of Ahli United Bank, said that the bank’s share of the Egyptian market is 3%, stressing that the bank is keen on increasing that share over the upcoming period. El Messeery pointed out that the bank achieved net profits worth EGP 1.462bn by the end of 2018, noting that the total business size of the bank reached $51bn. The CEO’s statements came during the signing event of a partnership agreement between the bank and AXA Life Insurance Egypt, with the aim of offering the company’s insurance services in the bank’s 42 branches across the country. Moreover, El Messeery added that the bank’s administration has been working for many years on developing the bank and restructuring the departments in it, stressing that the bank has come a long way in the development operations which she described as “continuous” over the upcoming period. “The development and restructuring process so far has included the departments of retail banking, credit, marketing, risk, as well as treasury and funds management,” the CEO declared. Finally, El Messeery stressed that the bank is growing slowly but in a stable manner which maximises its profits and the return on assets and capital. The post Banking coalition funds Al Sharqiya Sugar Manufacturing Company with EGP 3.1bn appeared first on Daily News Egypt. Banque Misr has led a coalition which includes several banks and financial institutions in order to sign a contract to increase joint funding provided to Al Sharkiyah Sugar Manufacturing Company (Al-Nouran) with EGP 1.35bn, taking the total funding to EGP 3.1bn. This aims to continue repaying the investment cost of the company’s factory and fund its working capital. The coalition includes Audi Bank; Abu Dhabi Islamic Bank; Egyptian Export Development Bank; Arab Bank; Banque du Caire; Abu Dhabi National Bank; Egyptian Arab Land Bank; EG Bank; Industrial Development Bank; Bank of Alexandria; the United Bank; the Arab Fund for Economic and Social Development, and the Islamic Corporation for the Development of the Private Sector. The total funding provided by the coalition will be used to continue financing the establishment of a beet sugar factor in Salihiya city in Al Sharqeya governorate, with a production capacity of up to 12,000 tonnes daily squeezed beet, and a refining capacity of 1,700 tonnes of sugar, in addition to an annual squeezing capacity of 235,000 tonnes, and 318,000 tonnes in refining capacity. The investment cost of the factory after the increase is EGP 5.8bn, funded by the banks in the coalition with a total of EGP 3.1bn. Self-funding was injected by shareholders, worth EGP 2.7bn. This project bridges the gap between the supply and demand of white sugar, which is currently estimated to be 1m tonnes, thus reducing importing, and therefore increasing the availability of foreign currencies. The fruitful cooperation between the participating banks and the company’s administration had a positive impact on the continuing establishment of the factory. Operation started in early March 2019. Noteworthy, the banks working in the Egyptian market always seek to be part of the state’s plan in sustainable development through encouraging local investments in order to support local products, reduces imports and aids in achieving self-sufficiency, as well as improving the quality of local industries. The post Faisal Islamic Bank intends to increase its capital by $73.36m appeared first on Daily News Egypt. The ordinary general meeting of the Faisal Islamic Bank of Egypt approved the increase of the issued and paid-up capital by $73.36m to reach $440.19m, up from the current $366.83m. According to a statement sent by the bank to the Egyptian Exchange, the issued and paid-up capital will be increased through issuing free shares in US dollar, financed from retained earnings by 20% of the issued and paid-up capital as one free share on every five original shares. The bank’s board of directors called on shareholders to hold an extraordinary general assembly on Thursday 27 June to determine this matter. If the required quorum was not achieved, it will be postponed to Thursday 18 July. In another context, the bank revealed a rise in the value of its business by 13.7% at the end of February 2019, to register EGP 95.98bn, against EGP 84.43bn in February 2018. The bank explained that its total assets reached EGP 94.31bn at the end of February 2019, compared to EGP 83.18bn in February 2018, up by 13.4%. Furthermore, the bank’s equity has grown by 21.5% to EGP 10.27bn, up from EGP 8.45bn. According to the bank, the value of current accounts and savings vessels scored EGP 79.52bn at the end of February 2019, against EGP 71.64bn in 2018, while the total investment balances reached EGP 87.22bn, up from EGP 77.31bn during the same time frame. The post Kabil joins HDB board appeared first on Daily News Egypt. The Housing and Development Bank’s (HDB) general assembly approved on Wednesday the appointment of Tarek Kabil, former minister of trade and industry, as an independent member of the bank’s board of directors, after obtaining the approval of the Central Bank of Egypt (CBE). The board of directors of the HDB includes Fathi Sebaey as chairperson and Hassan Ghanem as deputy chairperson and managing director. The board also includes Khaled Mahmoud Abbas, Randa Ali El Menshawy, Kamal El Sayed Fahmy, Assem Abdel Hamid El Gazar as representatives of the New and Urban Communities Authority, as well as Mei Abdel Hamid as representative of the Mortgage Finance Fund, Hossam El Din Hafnawy who represents Misr Insurance Company, Gamal Sorour Salem representing Misr Life Insurance, Ahmed Attia Abou El Wafa who represents the Egyptian Endowments Authority, Tarek Kabil, and Naira Amin as experts. The post Fayed selected as FEB board member appeared first on Daily News Egypt. The general assembly of the Federation of Egyptian Banks (FEB) has chosen Tarek Fayed, chairperson and CEO of Banque du Caire, to become a member of the FEB’s board of directors. Fayed succeeds Hassan Abdel Meguid, the former CEO of SAIB Bank on the FEB’s board, after the latter left the bank. The FEB’s board of directors currently includes Hisham Ezz Al-Arab as chairperson, Hisham Okasha as vice chairperson, and Akram Tenawi as board member and treasurer. It also includes Mohammed al-Deeb, Mohamed El-Etreby, Ahmed Ismail Hassan, Elsayed Elkosayer, and Hala Sakr. The FEB actively contributes to achieving several goals, such as deepening the concept of correct banking workflow, following unified systems and procedures, putting an ethics code in place, consulting on all issues resulting from free competition among banks, as well as strengthening scientific, cultural, and social links between the banks operating in Egypt and abroad. Fayed has over 30 years of experience in the banking sector in international and local institutions. Prior to joining Banque du Caire, he served as deputy governor of the Central Bank of Egypt (CBE), where he supervised several files related to improving supervision and preparing a supervisory directory, through which he contributed toward limiting the risks that the banking sector may have faced. He also implemented the Basel standard and issued the first financial stability report in 2016. Fayed also represented the CBE in a number of regional and international organisations, such as the Arab Trade Financing Programme, the financial stability team at the Arab Monetary Fund, the Preferential Trade Area of the Common Market for Eastern and Southern Africa (COMESA), the technical committee of the Islamic Financial Services Board, and contributed in the International Monetary Fund negotiations. Besides his role at Banque du Caire, Fayed is also a board member at iScore, as well as at the Credit Guarantee Company, and the Cairo Leasing Company. The post NBE’s syndicated loans reach EGP 15bn in 1Q19 appeared first on Daily News Egypt. The Bloomberg’s international banks’ assessment during the first quarter (Q1) of 2019 showed that the National Bank of Egypt (NBE) ranked first in the Egyptian banking market in terms of syndicated loans, where the bank acted as the finance agent, bookrunner, and marketer of joint loans. The value of syndicated loans that the NBE arranged during this period reached EGP 15bn, with a market share of 6.8%. According to Bloomberg, the NBE has also won the fifth position in Africa, and the same rank across the Middle East for syndicated loans, acting as the finance agent after institutions and international banks. According to Hisham Okasha, chairperson of the NBE, the bank’s provision of all necessary financing for various sectors is a continuation of its role to support the public and private sectors with creditworthiness and economic feasibility, both directly and indirectly, as a strategic partner in the financing of these projects. Okasha stressed that the bank constantly pays close attention to the joint loan deals, as part of its keenness to carry out its role as the largest bank operating in the Egyptian market. He also referred to the bank’s interest in megaprojects related to vital sectors in the fields of agriculture, industry, petroleum, electricity, transport, communications, construction materials, contracting, food, and real estate development, which contribute to creating added value for the Egyptian national economy. According to Yehya Aboul Fotouh, deputy chairperson of the NBE, the bank’s acquisition of this valuation comes as a result of its strong relationship network with local and foreign banks, who have confidence in the NBE’s ability to complete and manage large transactions professionally. He pointed out that the NBE has a large capital base, which gives it the opportunity to inject large funds, either individually or through participating in banking alliances. Moreover, Aboul Fotouh added that effective and fruitful cooperation with other Egyptian banks also reflects the strong relationship between all banks operating in the banking sector. 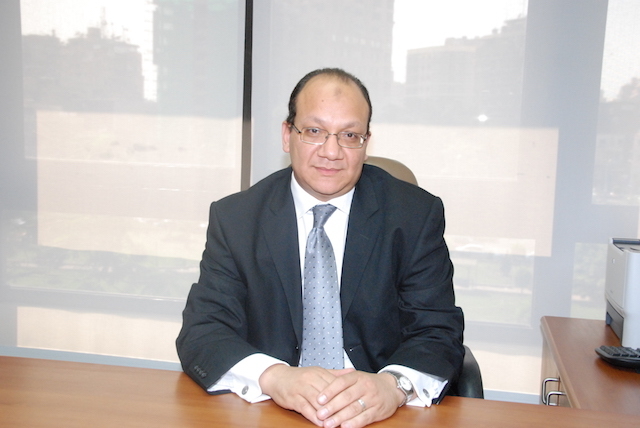 According to Bloomberg’s global assessment, the success of the NBE in maintaining its leadership of the Egyptian and African banking market in the field of syndicated loans for consecutive years is mainly due to the professionalism, speed of performance, and the efficient employees in the bank’s sectors concerned with these loans, according to Sherif Riyad, head of the bank’s Corporate Credit and Syndicated Loans Department. He stressed that the bank pays enduring attention to the human element, which he considers its true wealth. The post Attijariwafa Bank Egypt to be amongst biggest 10 banks in local market end-2022: Managing Director appeared first on Daily News Egypt. Attijariwafa Bank Egypt aims to significantly expand in the Egyptian market in the coming years, to become among the top 10 banks in Egypt by the end of 2022, according to Hala Sakr, the bank’s managing director. Sakr stressed that the bank’s management is taking effective steps toward achieving the bank’s expansion strategy, and expressed pride in the progress achieved by the bank in the Egyptian market since its entry in May 2017. “We are doing our best to come up with outstanding banking products and services, which are instrumental in achieving customer satisfaction and attracting new customers,” she said. Attijariwafa Bank launched its branch in Egypt on 3 May 2017 after acquiring all the shares of Barclays Bank Egypt. The bank offers a wide range of banking services to the retail and corporate sectors and small and medium-sized enterprises (SMEs). Attijariwafa Bank is based in Morocco and operates in 25 countries through 4,930 branches with 20,000 employees. The bank runs a portfolio of 9.7 million customers. Last Thursday, Attijariwafa Bank Egypt opened its new branch in Cargo Mall in Sheikh Zayed, as one of six new branches in Cairo, Giza, Dakahlia, and Minya. The bank also expanded and renovated its branch in Al Mahalla Al-Kubra, moved to a new building in Damanhour, and moved its Zamalek branch. The bank’s branch network currently comprises of 61 branches and 73 ATMs, covering most of the republic with over 1,400 employees. According to Sakr, the bank’s strategy contributes to the achievement of financial inclusion, which is one of the most important priorities of the Egyptian government and the Central Bank of Egypt (CBE) due to its positive role in achieving economic growth and sustainable development. She also pointed out that the bank aims to draw its Egyptian clients closer to those in Africa, as this coincides with Egypt’s current presidency of the African Union, and the CBE’s chair of the Association of African Central Banks. Furthermore, she explained that the bank conducted about 600 meetings between Egyptian customers and officials in African countries through a conference held in Morocco in March. Mohamed Sherif, board member, CFO and transformation director of the bank, said that after the acquisition of Barclays Egypt in May 2016, the bank’s management started developing a five-year strategy for the bank’s activity, ending in 2022, using one of the largest advisory offices which assists financial institutions, along with the assistance of the executive management and the working team in Egypt. The strategy was developed under the slogan “We believe in You” and aims to focus on a strong presence in the Egyptian market, based on the belief of the mother group of the importance of the Egyptian market. Sherif explained that the strategy depends on presenting something new to the market through focusing on opening the markets, not just locally but also internationally, based on the fact that the group is present in 14 countries in west Africa, where it also aims to open trade doors between its customers in Egypt and exporters and importers in these countries. According to Sherif, the bank’s strategy is also focused on expanding in all of Egypt’s governorates, noting that in May 2017 the bank was located in 17 out of 27 governorates, and targets by the strategy’s end in 2022 to have a presence in most of the provinces. “The strategy is reviewed annually according to the market’s conditions. In 2018, we focused on modernising the bank’s infrastructure, as we changed all the computer systems in the bank in record time with investments of EGP 1bn,” Sherif said. He added that Attijariwafa Bank aims to invest more in developing its infrastructure in order to expand in providing new banking products and electronic services, therefore contributing toward achieving financial inclusion, and attract non-participants within the banking system to achieve economic growth and sustainable development. “The network of trade branches is now 61 branches and we aim to reach 150 in 2022,” he said. Over and above, Sherif pointed out that the bank is also focusing on expanding the provision of technological and digital services, which are the cornerstone of the bank’s strategy, such as human resources. The bank pays great attention to three key finance sectors: major companies which account for about 13% of the bank’s total loan portfolio; medium and small companies which are the heart of the bank’s strategy, and the retail sector where the bank has extensive experience, according to Sherif. In response to a question about whether the bank will increase its capital in the coming period, Sherif said that the bank’s management has decided to keep all achieved profits in support of the bank’s financial position in Egypt. Furthermore, the bank’s current capital is sufficient for its targeted expansion. Additionally, the bank also aims to achieve a 20% growth rate by the end of 2019, against 2018, with varying growth rates among different sectors. Plus, he pointed out that the bank’s strategy is focused on growth and expansion in a manner that will help it achieve its 2022 goals. “We are currently present in 17 governorates and we are working on implementing the bank’s expansion strategy gradually over the next five years. We have opened six branches during the first quarter (Q1) of this year, and more openings will be announced later this year,” he added. He pointed out that the opening of the six new branches is in line with the bank’s expansion strategy, which aims to provide comprehensive banking services to its customers wherever they are, in addition to expanding its activity and reaching the largest number of customers. Furthermore, El Hachimi revealed the intention of the bank is to launch prepaid cards and credit cards soon after finalising all the procedures. The bank has completed the procedures to accept the Meeza ATM cards, in cooperation with the Egyptian Banks Company, he pointed out. Moreover, the bank aims to launch mobile and internet services in May, and launch the ‘Smart Wallet’ soon, in cooperation with an electronic payment company, he added. Additionally, he noted that the bank started issuing a new range of banking products before the end of 2018 in order to meet the needs of different customers, such as Alfa Saving and current accounts with higher returns. Over and above, El Hachimi said the bank intends to launch credit cards for women to help them pay their bills, and that there will be added advantages on the card, such as some discounts in several shops, malls, and brands. “SMEs account for 9% of the bank’s total loan portfolio. We are creating financing programmes that are important to these projects, as well as expanding the network of branches and expanding in governorates to reach customers everywhere, in order to attain the 20% set by the CBE,” he added. Plus, he stated that the bank is in the process of setting up two business centres in Alexandria and Heliopolis, specialising in serving SMEs. He ruled out the bank’s consideration of acquiring other banks in the Egyptian market, stressing that the expansion of the Attijariwafa Bank in Egypt will be achieved through opening new branches. The post Egypt’s balance of international bonds in European currency rises to €4bn appeared first on Daily News Egypt. Egypt’s balance of bonds launched in international markets in the European currency has increased to €4bn after the success of the ministry of finance to launch two new tranches worth €12bn on Thursday. The ministry of finance said that there was a significant and growing demand on these bonds, nearing €9bn, which is four times over the value of the offering. The bonds were issued on two tranches. The first was of a six-year term worth €750m, due on 11 April 2025, the second was of 12-year term worth €1.25bn, due on 11 April 2031. The ministry pointed out that the demand on bonds resulted in reducing the price of the initial yield announced by the ministry at the start of the day with 50 basis points. This is a major drop. The two new bonds were issued with final yield prices of 4.750% for the six-year bonds, and 6.375% for the 12-year bonds. Furthermore, the ministry added that the new bonds witnessed strong participation by foreign investors and many international markets, as their numbers jumped from 450 investors, which confirms the growing confidence of the finance and business circles in the Egyptian economy. European investors came first with a 55.2% participation, followed by North America by 33.2%, then Asia by 9.6%, according to a statement by the ministry. The statement explained that four European banks have managed the launching operations in favour of the ministry of finance. These banks are BNP Paribas, Natixis, Standard Chartered Bank, and Alexandria Bank Intesa Sanpaolo. the ministry of finance was represented by the Dechert bureau, as an international legal advisor, in addition to Al-Tamimi Bureau, as a local advisor, in order to complete all the legal measures related to the issuance. The ministry launched bonds worth €2bn launched on 16 April 2018 over two tranches. The first is worth €1bn, with a 4.75% yield due on 16 April 2026. The second is of the same value with a yield of 5.625% due on 16 April 2030. Noteworthy, there are other US dollar bonds whose balance is estimated at $23.21bn. The post Three Egyptian banks among 500 best banking brands in world appeared first on Daily News Egypt. Three Egyptian banks got on the list of the 500 best banking brands in the world in 2019, according to an analytical study issued by the Union of Arab Banks (UAB). The list includes the National Bank of Egypt (NBE), Banque Misr, and the Commercial International Bank (CIB) -Egypt. The total value of the three banks is estimated to be $984m, and their total market capital reached $9.6bn. The NBE got the title of the highest value banking brand in Egypt in 2019. It also ranked 21st in the Arab world and 292 in the world, which is higher by 27 positions compared to 2018, with a brand value of $478m. Banque Misr came second locally, 34th in the Arab world, and ranked 398 globally with a value of $278m. The CIB came third locally, 40th in the Arab world, and 455 globally with a value of $228m. The data recently issued by the Banker magazine, which included the 500 largest banking brands in the world, revealed that 45 Arab banks are on the list, compared to 43 banks in 2018. The total banking brands’ value of these banks reached $40.8bn, compared to $36.7bn in 2018. The total market capital reached $280.3bn. Saudi Arabia and the UAE have recorded the largest number of Arab banks on the list, as 12 Saudi Arabian and Emirati banks were on the list, followed by six Qatari banks, two Lebanese banks, and one bank in Jordan, Oman and Bahrain. The post EGP 550m increase in HDB profits in 2018 appeared first on Daily News Egypt. The business results of the Housing and Development Bank (HDB) revealed that the bank achieved net profits of EGP 1.62bn at the end of 2018, compared to EGP 1.07bn at the end of 2017, with a 51% growth. The bank’s profits before taxes reached EGP 2.2bn, compared to EGP 1.5bn, with a 47.4% increase. The HDB held last week its regular and irregular general assembly meeting for the fiscal year ending in December 2018, as all the items in the agenda of the assembly were approved, and the report of the activity of the bank by the board of directors and its financial position in 2018 was also passed. According to the bank’s performance index, the return on equity (ROE) reached 3.4% in 2018, compared to 2.07% in 2017. The yield on property rights increased to 50%, compared to 43.25%. A share of the net profits achieved by the bank in 2018 increased to EGP 12.89, compared to EGP 6.55 in 2017. According to the bank, the capital adequacy ratio is 21.01%, in the light of the optimal application of credit policies and the absence of any dangerous assets in the bank’s investment portfolio. Despite the challenges and difficulties which the Egyptian economy faced, the bank has managed to reach achievements at the level of the volume of its activities and presence, while maintaining acceptable risks, according to the bank. The bank explained that its total assets recorded EGP 47.8bn at the end of 2018, and the total loan portfolio amounted to EGP 15.7bn, compared to EGP 13.4bn in 2017, with a 17% increase. Furthermore, he added that the total deposits reached EGP 34.10bn at the end of 2018, compared to EGP 40.9bn in 2017, as a result of the declining balances of clients who benefit from social housing by EGP 9.1bn. The total deposits excluding passing clients reached EGP 30.4bn, compared to EGP 28.1bn in 2017, with an 8.2% growth. According to the bank, the net income from yield was EPG 3.1bn in 2018, compared to EGP 2.6bn in 2017. The increase in the net income from profits reached 23.2%. The yield from loans and similar incomes reached EGP 6.1bn by the end of 2018, compared to EGP 4.9bn with 30.1% increase compared to 2017. It explained that the yield of loans reached EGP 1.9bn with an increase of 30.3%, compared to 2017. The yield from the employment balances in banks increased to EGP 1.6bn with an increase of 22.6% compared to 2017. It pointed out that the treasury bills yield reached EGP 2.1bn, with an increase of 35.9%, compared to 2017, while the yield of government bonds reached EGP 485m, with an increase of 34.6%, compared to 2017. On the other hand, the bank explained that the cost of deposits and similar costs amounted to EGP 3bn at the end of 2018, compared to EGP 2.1bn at the end of 2017, with an increase of 38.8%. The net income from the fees and commissions at the HDB rose by EGP 26m, with 9.3% increase for 2017, while the distribution of affiliated companies’ profits reached 82.5%, compared to EGP 80m, with an increase of 8.6%, compared to 2017. In the same context, the bank revealed an increase in the profits of the bank’s housing projects by EGP 82.8bn, reaching EGP 444.8bn, with a 22.9% increase, compared to 2017. It noted that the net profits from the bank’s housing activities for 2018 reached only 19%, which stresses the bank’s interest in the banking side to become one of the largest 10 banks according to the bank’s future strategy. According to the bank, the administrative expenses amounted to EGP 1.41bn in 2018, compared to EGP 1.07bn in 2017, with a 32% increase, as a result of the increase activity of the bank and opening new branches, in addition to increasing promotional campaigns and donations. “The bank’s administration stresses that the positive results of the bank reflect the efficiency and flexibility of the executive policies and measures that helped the bank develop its operations, overcome crises, face competition strongly in the market, and benefit from available opportunities,” according to the bank. He pointed out that the bank’s branch network reached 84 branches, aimed to increase to 100 over the upcoming period with the aim of achieving better geographical coverage for all clients to meet their needs. The bank added that it will continue to support the activity of real estate funding as leader in the field of housing projects. The bank also aims to provide integrated solutions through subsidiaries and sister companies whose activities integrate with the bank’s activity in the banking and real estate field. The bank aims to achieve the goals of its future strategy to continue growth in all indexes, relying on increasing its share in the banking field. The post NBE net profits reach EGP 10.1bn by end-June 2018 appeared first on Daily News Egypt. The post Resignations, leadership reshuffle in banks operating in Egypt appeared first on Daily News Egypt. Banks operating in Egypt saw a wave of resignations and a leadership reshuffle last week. Mohamed Abbas Fayed, the chairperson and managing director of Bank Audi Egypt, has resigned from his position which he has held since June 2016. Fayed is expected to leave the bank by the end of April. Over the years he spent in Bank Audi Egypt, Fayed achieved a leap in the bank’s indexes, as profits went up from EGP 400m to EGP 1.3bn. The loans portfolio also increased from EGP 11bn to EGP 31bn, and deposits from EGP 27bn to EGP 60bn. Additionally, Fayed has managed to develop businesses, products, and marketing and selling systems of the bank so that it has become one of the largest six banks in the private sector in Egypt. 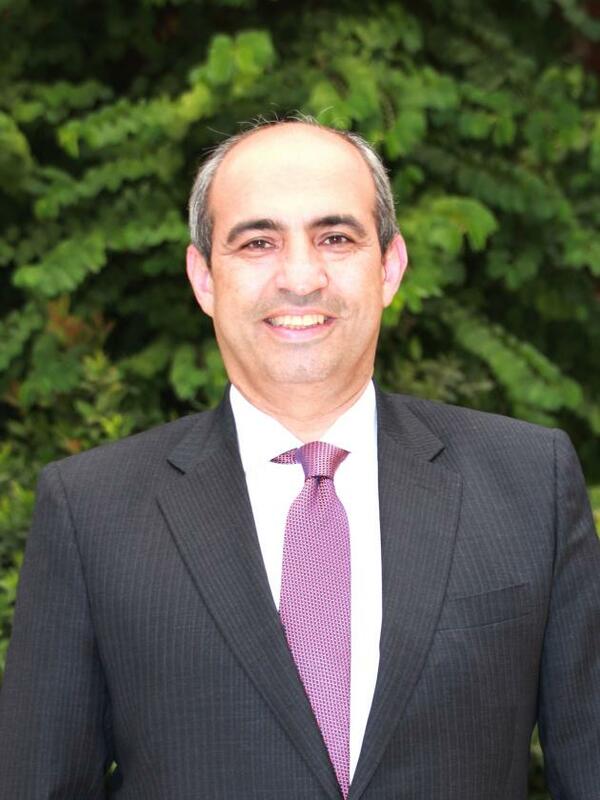 Fayed has 30-years of work experience in the banking sector, during which he worked in two banks other than Bank Audi: Banque Misr and Cairo International Bank, which was acquired by NSGB, then by QNB Alahli. Moreover, Yasser Hassan, the chairperson of the National Bank of Kuwait-Egypt (NBK) submitted his resignation to the bank’s general assembly. Hassan has occupied his position at NBK for over 12 years. The NBK entered Egypt in 2007 by acquiring Al Watany Bank of Egypt. Sources close to Hassan said that he was nominated to assume the chairpersonship of the National Bank of Egypt UK. Last week, Misr Iran Development Bank (MIDB) also witnessed a board restructure, as Amr El Garhy, the former minister of finance, was appointed as a non-executive chairperson of the bank, replacing Ashraf El Sharkawy, the former public enterprise sector minister. El Garhy has wide experience in the banking and investment field, having held several positions before being appointed as minister of finance, including chairperson and managing director of the National Investment Bank (NIB) and vice chairperson of QNB Alahli. He was also the chairperson of the Commercial International Investment Company (CIIC), the managing director of EFG Hermes, a board member of Alexbank and the Arab Contractors Company. The changes in leaderships also included appointing Mahmoud El Sakka, chairperson of the corporate and institutional sector at Arab African International Bank (AAIB) as a managing director of the bank, succeeding Amr Tantawy, who has recently resigned. El Sakka has a banking experience of up to 30 years in the fields of funding, investment, and banking, as he spent his first 10 banking years in MIDB. He also occupied the position of a general manager and head of institutional branches committee at AAIB as well as the member of the executive committee and asset management and commitments committee at the bank. He was also a member of the Egyptian Credit and Risk Association (ECRA). Moreover, Zeinab Hashem, the chairperson of ADIB Capital, a subsidiary of Abu Dhabi Islamic Bank, was selected to be a member of the bank’s board of directors in its new form. The past few days also saw the end of Ihab El Swerki’s board membership in the Union National Bank-Egypt after he occupied the position of an executive board member and managing director of the bank. The market is expecting to see more changes as the new Banks Law will be issued in the upcoming period, preventing executive officials from staying in their positions for more than three consecutive terms. Analysts believe that these resignations were mainly due to the near issuance of the law. The Central Bank of Egypt (CBE) had completed drafting the law earlier this year and sent it to the cabinet for reviewal, in preparation for discussion in parliament. According to Gamal Negm, the deputy governor of CBE, the law is still under discussion by the legislative committee at the cabinet, in preparation to present it to the parliament during the upcoming period. The post Banks operating in Egypt are strong, safe: CBE appeared first on Daily News Egypt. The ratio of non-performing loans (NPLs) to all loans in banks operating in the Egyptian market declined to 3.9% by the end of December 2018, down from 4.4% in September 2018, according to the Central Bank of Egypt (CBE). In its quarterly report on the financial position of banks, the CBE said that NPLs fell to 2.8% in December, from 3.2% in September 2018 in the top 10 banks, and to 2.4% from 2.7% in the top five banks. The CBE noted that banks secured provisions of 98% of total NPLs at the end of December 2018. The ratio reached 100% at the 10 and five largest banks. “The provisions secured by banks to combat bad debt reached EGP 118.18bn at the end of December 2018, of which the largest five banks accounted for EGP 62.10bn, while the largest 10 banks’ NPL provisions reached EGP 74.19bn,” the CBE’s report read. It added that the banks’ reserves reached EGP 202.84bn at the end of September 2018, with the top five banks recording EGP 129.83bn, and the top 10 banks had EGP 156.52bn. According to the CBE, the loans to deposits ratio (LDR) in banks operating in the Egyptian market increased to 47.8% last December from 45.8% in last September. The ratio stood at 45.9% in the top 10 banks, and 47.2% at the top five. The CBE noted that the LDR in local currency reached 39.3% in December, from 39% in September 2018. While the LDR in the top 10 banks stood at 35.3%, and 35.2% in the top five. Meanwhile, foreign currencies’ LDR grew slightly in December to 76.7%, compared to 69% in September 2018. The ratio registered 83.2% in the top 10 banks, and 96.3% in the top five. “The private sector has taken over 58.7% of total loans granted by banks to their clients at the end of December, against 61.8% in September, June, and March 2018,” the CBE stated. It added that the private sector has acquired 50.2% of the total loans in the top 10 banks, and 47.5% of the loans in the top five banks. “The total deposits in banks until the end of December 2018 amounted to EGP 3.8tn, including EGP 2.38tn in the top five banks, and EGP 2.8tn in the top 10,” noted the CBE. Furthermore, the ratio of bank deposits to assets in December reached 70.2%, against 68.8% in September. The ratio reached 68.3% in the top 10 banks, and 67.1% in the top five. The average liquidity ratio in local currency in banks rose to 44.3% in December, up from 42.2% in September 2018, scoring 46.2% in the top 10 banks, and 46.3% in the top five. Moreover, the average foreign currency liquidity ratio fell to 59.7% in December, from 63.1% in September. This ratio fell to 58.4% in the top 10 banks, and 56.1% in the top five. On a different note, the CBE said that banks’ securities portfolios reached about 16.2% of total assets in banks in December, against 12.8% in September 2018. The ratio stood at 18.1% in the top 10 banks, and 18.5% in the top five. Moreover, according to the CBE, banks’ investments in securities and treasury bills (T-Bills) reached EGP 1.90tn at the end of December 2018, amounting to EGP 1.31tn in the top five banks, and EGP 1.51tn in the top 10 banks. “The total capital of banks operating in the Egyptian market amounted to EGP 150.59bn at the end of December 2018,” the report stated. It also highlighted that the capital of the top five banks amounted to EGP 80.42bn, while the top 10 banks’ capital reached EGP 98.70bn. The CBE did not disclose the names of those five or 10 banks, however, the market names the National Bank of Egypt, Banque Misr, the Commercial International Bank, Banque du Caire, QNB Alahli, the Arab African International Bank, HSBC, Faisal Islamic Bank, Alex Bank, and Credit Agricole. According to the CBE, the return on average assets (ROAA) of banks operating in the Egyptian market stabilised at 1.5% at the end of December, consistent from September, June, and March 2018, but below the ROAA of 2% at the end of December, September, June, and March 2017. The ROAA scored 1.4% at the top five and 10 banks. It further added that the return on average equity (ROAE) of banks stabilised at 21.5% at the end of December, also constant from September, June, and March 2018, but fell from 30.9% in December, September, June, and March 2017. The ROAE scored 20.5% in the top 10 banks and 20.3% at the top five. The net margin of return reached 3.9% in December, unvarying from September, June, and March, and down from 4.6% in December, September, July, and March 2017. It reached 3.6% in the top 10 banks, and 3.5% in the top five. Regarding banks’ capital adequacy index, the CBE explained that the financial position of banks-excluding the CBE-scored EGP 5.432tn at the end of 2018, against EGP 4.813tn at the end of 2017, growing by EGP 619.3bn, or 12.8%. The figure reached EGP 4.1tn for the top 10 banks against EGP 3.6tn in December 2017. Moreover, the largest top five banks dominated 65% of the total financial position of the banking sector. The financial position of these banks has been around EGP 3.56tn at the end of December 2018, against EGP 3.14tn at the end of December 2017, growing by 13.3%. Regarding the banks’ capital adequacy index, the CBE explained that the capital to risk-weighted assets ratio (CRAR) in banks increased to 16.2% by the end of December, compared to 16% in September 2018. The ratio scored 15.9% in the top 10 banks, and 16.1% in the top five. The tier 1 capital to risk-weighted assets scored 13.2% in December 2018, up from 13% in September 2018, and amounting to 12.6% in the top 10 banks, and 12.7% at the top five. The continuing CRAR reached 9.6% in December, against 9.3% in September 2018, reaching 8.9% in the top 10 banks, and 8.6% in the top five banks, according to the CBE. The rate of leverage in banks reached 6.4% in December, unchanged from September 2018. This ratio reached 5.8% in the top 10 banks, and 5.6% in the top five banks. The percentage is recommended starting from the end of September 2015 until 2017 and is obligatory starting from 2018, with a lower margin of 3%, as per the CBE’s report. The post CIB Egypt signs cooperation protocol with ‘Business Women of Egypt 21’ appeared first on Daily News Egypt. The Commercial International Bank – Egypt (CIB) has signed a cooperation protocol with the Business Women of Egypt 21 (BWE21) – a self-financed non-governmental organisation (NGO) – within the bank’s efforts to support women in general, and business women working in small and medium-sized enterprises (SMEs) specifically. The protocol provides the BWE21 with an exclusive sponsorship agreement from the bank, and stipulates that they will jointly organise conferences and workshops to raise awareness about banking and how to obtain bank financing. The protocol also includes the development of a group of banking services specifically designed for the members of the BWE21. Announcing the protocol came during the bank’s participation in the annual conference of BWE21 which included a review of the most important achievements of the NGO in Egypt for women in 2018. It tackled Egyptian exports to the Canadian market through the commercial representative offices of the ministry of foreign affairs. The conference also addressed possible economic and investment opportunities in Egypt in 2019. The partnership comes in view of the CIB’s efforts to support the members of BWE21 by providing them with the experience required to develop their businesses. The bank aims to offer a stable environment for businesspersons so that they can safely develop their businesses, and it also offers innovative banking solutions to attract new social segments to the banking sector in order to further enhance financial inclusion. Noteworthy, CIB Egypt won the Best Online Cash Management, the Best Trade Finance Services, and the Best Online Portal Services awards in Egypt by Global Finance. London Business School has also included the bank in 2018 in its studies as one of the successful business models. In 2019, Bloomberg included CIB in its gender equality index, making it the first Arab and African institution to enter that index, which includes 230 institutions representing 10 different sectors from 36 countries worldwide. The post Suez Canal Bank increases branch network by 2 branches to 43 appeared first on Daily News Egypt. Chairperson and Managing Director of Suez Canal Bank, Hussein Refaei, inaugurated two new branches of the bank, bringing its branch network to 43. The bank’s first branch was opened in Dokki district in Giza, and the second was in Glim district in Alexandria. This is part of the expansion plan adopted by the bank, which aims to intensify its presence across the country. According to Refaei, the opening of new branches reinforces the strategy of the Suez Canal Bank which aims to reach out to new customer segments. It is also in line with the Central Bank of Egypt’s financial inclusion initiative which aims to increase confidence in the services provided by the banking system, and implement Egypt’s Vision 2030 for sustainable development. He added that the bank is interested in expanding in digital services in order to offer better services to its customers whether via debit cards, credit cards, and electronic wallets, in addition to internet banking. The bank also provides a dedicated call centre to ensure quality service for customers. The bank is currently implementing the necessary procedures for the approval of transactions related to all payment cards pertaining to any of the international payment networks, or to the bank, he pointed out. The Suez Canal Bank also seeks to increase its loan portfolio of small, medium, and small enterprises so as to include marginalised groups, highlighted the bank’s chairperson. “This will support the country’s plans to provide more employment opportunities for the youth and women, especially in remote areas, hence achieving development and improving the income levels of individuals in order to eliminate unemployment and poverty,” he explained. The Suez Canal Bank succeeded in increasing its loans portfolio to EGP 13.5bn in 2018, up from EGP 10.2bn at the end of 2017, an increase of 32%, Refaei said. In conclusion, he noted that such indicators have reflected on the bank’s net profits during the past two years, recording EGP 420m in 2018, up from EGP 210m in 2016. The post Tamweely negotiates with 4 banks for supplementary financing of EGP 400m appeared first on Daily News Egypt. Tamweely Microfinance has launched its new expansion strategy for 2019 which aims to increase the number of the company’s branches and its portfolio size, introduce new financial products, and sign cooperation agreements with banks and financial institutions. “This strategy is based on the company’s success in the last few months, since its inception seven months ago,” said Chairperson and Managing Director of the company, Amr Abu Al Azm. He added that the size of the company’s finance portfolio during this relatively short period reached EGP 170m benefiting 13,000 clients. Abu Al Azm added that Tamweely has now 20 branches in eight governorates, including two branches in Beni Suef, two in Luxor, three in Minya, four in Sohag, three in Sharqeya, four in Qena, one in Aswan, and another in Alexandria. He further added that the company aims to open new 18 branches before the end of this year, to cover 11 governorates and reach 40,000 clients with a portfolio of EGP 700m. Abu Al Azm pointed out that over 70% of the company’s financing were directed to commercial projects. Ahmed Khorshid, the company’s CEO, said the company has signed financing agreements with six banks, including the Export Development Bank of Egypt, the Egyptian Arab Land Bank, the National Bank of Egypt, the Industrial Development Bank, the Housing and Development Bank, and the Suez Canal Bank, with credit lines of EGP 700m. Additionally, Tamweely is negotiating with four other banks for supplementary financing of EGP 400m. Khorshid said that the rapid growth achieved by Tamweely in its first months of operation was reflected in the financing size and employment rates of the company. It currently has about 400 employees and will likely double that figure by the end of this year. The company benefited from the huge growth witnessed by the microfinance industry in the Egyptian market at the current stage, as well as the technological support enjoyed by the financial services sector, explained the CEO. Moreover, Khorshid predicted that the industry will achieve annual growth exceeding 15% as the market strives for this type of funding, thanks to the government’s support of the sector, being an important generator of employment. He pointed out that the company’s business strategy and future expansion plans coincide with the growth of financial inclusion, and support the state’s plan to integrate the informal economy into the formal economy, in order to achieve social and economic goals by increasing employment opportunities and enabling low-income segments of the population to achieve higher incomes, characterised by sustainability and growth. Tamweely Microfinance was established with an issued capital of EGP 50m and an authorised capital of EGP 500m. It is owned by three companies, including NI Capital, Ayady for Investment and Development, and Post for Investment. The post Banking alliance arranges EGP 3.1bn worth joint loan for Samcrete Egypt appeared first on Daily News Egypt. A banking alliance has arranged a joint loan worth EGP 3.1bn for Samcrete Egypt. The alliance includes the National Bank of Egypt (NBE) and Banque Misr with a share of EGP 750m each, Banque du Caire and the Saudi Investment Bank (SAIB) with EGP 500m each, the Export Development Bank of Egypt (EDBE) with EGP 200m, and the Suez Canal Bank with EGP 100m. The loan aims to fund the contracting operations assigned to the company by the New Urban Communities Authority (NUCA) to implement the fifth residential district (R5) at the New Administrative Capital (NAC). Samcrete works in various contracting activities, including construction, road, and civil works, as well as infrastructure works and utilities, such as sewerage, irrigation, lighting, and railways, in addition to other activities such as investment, real estate development, product manufacturing, as well as concrete and building requirements. Arranging this loan stresses banks’ abilities to be part of this type of funding with its special nature, meeting the financial needs of many clients in various vital sectors in the Egyptian economy such as construction, petroleum, electricity, and transport. The loan also reflects the support of the participating banks toward the sector of contracting in general, which is one of the main economic sectors, given its important role in driving growth in the national economy, as well as creating many jobs and supporting several industries and other activities related to it. The loan also highlights the fact that these banks support the financial needs of Samcrete specifically as one of the distinguished Egyptian private sector companies in the field of contracting, contributing to the national development plan through the implementation of major projects, and establishing modern urban communities in the NAC. The post Banque du Caire’s NIAT jumps 200% to EGP 2.5bn end-2018 appeared first on Daily News Egypt. The post Volume of retail banking portfolio in NBE reaches EGP 63.3bn at end-February appeared first on Daily News Egypt. The post Banks supported their capital by EGP 9.69bn in 2018: CBE appeared first on Daily News Egypt. Banks working in the local market have supported their capital by EGP 9.69bn in 2018 to reach EGP 150.59bn by the end of December 2018, compared to EGP 140.901bn by the end of December 2017, according to the Central Bank of Egypt (CBE). In its quarterly report, the CBE revealed the developments of banks’ financial positions, revealing that the total value of the financial position of the Egyptian banking sector recorded about EGP 5.432tn by the end of last year, compared to EGP 4.813tn at the end of the previous year, with an increase of EGP 619.3bn, an equivalent to 12.8%. Banks’ reserves increased by EGP 22.5bn in 2018, reaching EGP 202.8bn, compared to EGP 180.24bn in 2017. According to the CBE, total deposits in banks by the end of December 2018 reached EGP 3.802tn, compared to EGP 3.314tn by the end of 2017, with an increase of EGP 488bn and a growth rate of 14.7%. The commitments of local banks toward foreign banks are nearly EGP 5bn, reaching about EGP 190.34bn by the end of 2018, compared to EGP 185.95bn by the end of 2017, while the balance of Egyptian banks in foreign banks reached EGP 161.739bn, compared to EGP 296.424bn. Moreover, the CBE pointed out that the banks’ lending and factoring balances reached EGP 1.814tn by the end of 2018, compared to EGP 1.463tn by the end of 2017, with an increase of EGP 351.2bn. The assets of other balances increased to EGP 329.722bn by the end of 2018, compared to EGP 278.34bn by the end of 2017. According to the CBE, securities and bank investments in treasury bills rose to reach EGP 1.901tn compared to EGP 1.698tn, with a growth of 11.2% on an annual basis.